This gorgeous Oriental Tea Tree Bonsai would make a great Father's day gift, especially with the specially selected accessories, which include a drip tray, pruning scissors, bonsai feed, care handbook, and a delightful 'Happy Father's Day' foil balloon. The bonsai tree itself has a stunning shape with neat pads of glossy green foliage, which are deeply complemented by the attractive blue ceramic pot. The serpentine trunk displays beautiful curves, off which come evenly spaced branches. During the summer months, this spectacular bonsai displays delicate white flowers, making this bonsai the perfect gift. 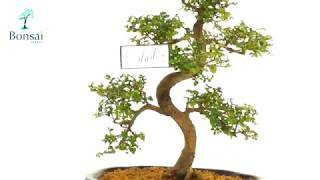 This easy-to-care-for bonsai would make the perfect, unique gift for a dad, and is great for beginners. Comes with free care instructions and free delivery to most areas of the UK. Fabulous Father's Day Bonsai kit. A very pretty flowering s-shaped Oriental Tea Tree Indoor bonsai with blue star shape balloon and all accessories. Great for beginners. Great fun!